Influencers can be problematic. Sure, they have big audiences and know how to rock a plandid on Instagram, but they also have a habit of saying and doing pretty dumb things that give their sponsors constant anxiety. Hey, they’re only human. But what if they weren’t? Virtual influencers are one of the odder ways companies are thinking about brand safety. These artificially generated personalities have the clout of flesh-and-blood social media stars, without all that pesky human unpredictability (ignoring, of course, the fact that virtual influencer accounts are also run by humans). Now KFC and agency Wieden + Kennedy are getting in on the virtual influencer action, but they didn’t throw their money at emerging cyber celebs like Lil Miquela, Shudu or Blowko. Instead, they made their own fictional fashionista and imbued him with the spirit of the chain’s founder, Colonel Sanders. 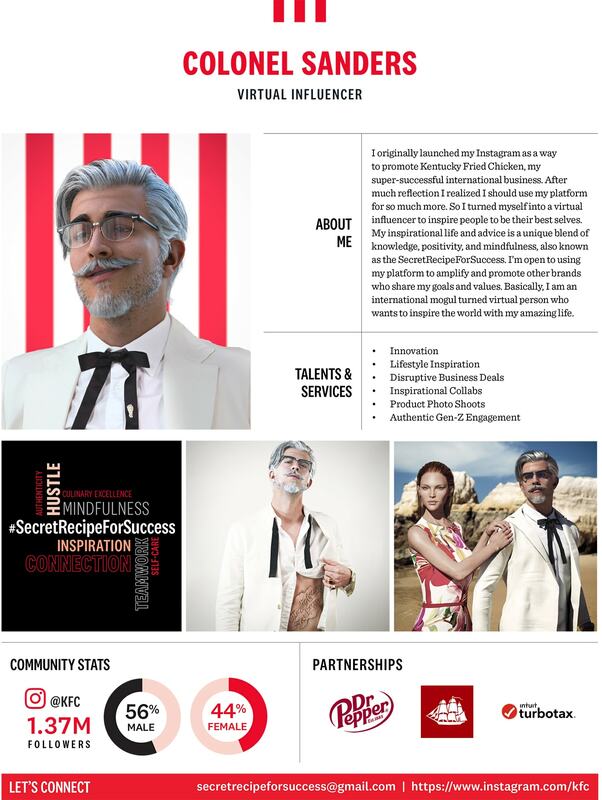 The Virtual Influencer Colonel, newest in the ongoing litany of reimagined reboots of entrepreneur Harland Sanders, has taken over KFC’s Instagram feed, where he’s showing off his aspirational lifestyle, espousing vapid words of regrammable advice and generally enjoying all the worldly benefits that being an artificial construct has to offer. Rendered digitally by Wieden + Kennedy Portland, Virtual Influencer Colonel began as a generic 3-D model o a male and was then adorned with facial features, hair and wardrobe to create just the right level of douchy entitlement and uncanny-valley oddity. But an influencer with only one client isn’t an influencer! That’s just branded content. So obviously, Virtual Influencer Colonel is going to need some other sponsors.